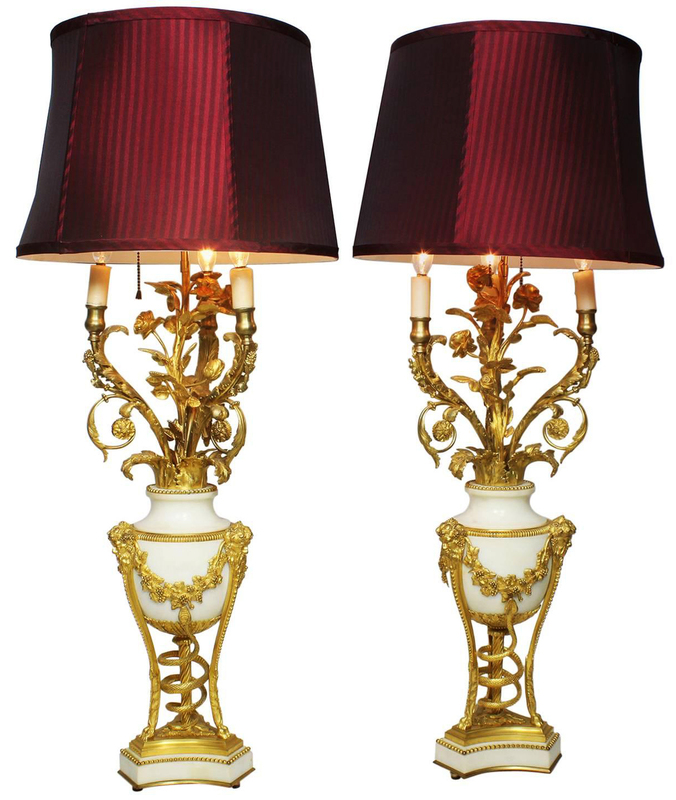 A Very Fine Pair of French 19th Century Louis XVI Style Ormolu-Mounted and White Marble Three-Light Candelabra (now electrified), each raised on tri-form cloven hoof topped feet below Bacchic monopodiae male figures connected by vine wreaths above an entwined serpent. 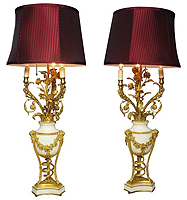 The three-arm upper candelabrum with ormolu scrolls and rose stems with rose-buds and leaves. 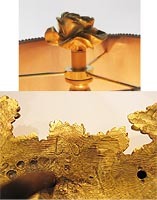 The ormolu stamped on the reverse "BY 22". Circa: Paris, 1880. Alfred Emmanuel Louis Beurdeley (French, 1847-1919) A Very Fine Pair of French 19th Century Louis XVI Style Ormolu-Mounted and White Marble Three-Light Candelabra (now electrified), each raised on tri-form cloven hoof topped feet below Bacchic monopodiae male figures connected with vine wreaths above an entwined serpent. The three-arm upper candelabrum with ormolu scrolls and rose stems with rose-buds and leaves. 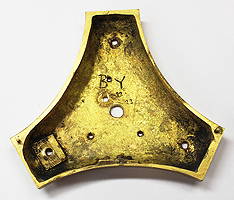 The ormolu bases stamped on the reverse "B Y 22 22". Fitted with contemporary burgundy shades. Circa: Paris, 1880. Beurdeley, Alfred Emmanuel Louis (French, 1847-1919): Work at first with his father in Paris and eventually succeeded him. He kept the shop at rue Louis-Le-Grand and had worked at Nos. 20 – 24 rue Dautancourt. The business continued in its traditional style with very few variations, until it was closed in 1895 and the remaining contents of the company were sold at the Galerie Geroges Petit. Beurdeley exhibited at the 1878 Exhibition.